Learn step-by-step how to use the color palette for Excel XP on your cells and content of your worksheets. Perhaps you want certain cells to have important text of numbers in a different color. (Red, for example, just begs to be taken notice of.) You can also change the color of any kind of content in a cell, text included. Once again, you can choose one of two ways to change the color of content in your cells. One is to use the Font Color button on the Formatting toolbar, and the other is to use the Format Cells dialog box. 1. Select the cell or range of cells whose content color you want to change. 2. Click the drop-down arrow next to the Font Color button located on the Formatting toolbar. 3. Select the color of your choice. 2. Choose Format ► Cells from the menu bar (or press Ctrl+1). 3. Click the Font tab. 4. From the Color option, click the drop-down arrow and choose a color that you want to use. 5. Once your satisfied with your choice, click OK.
1. 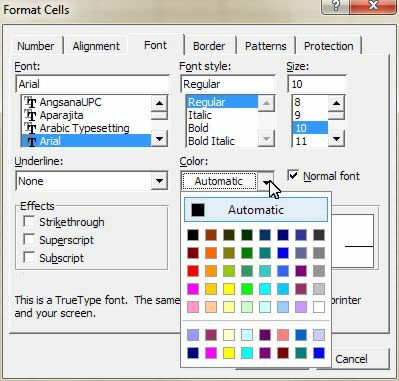 Select the cells or range of cells whose color you want to change back to normal.